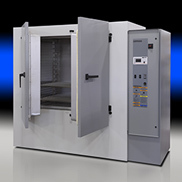 High-performing and solidly built using corrosion-resistant materials and over a century of manufacturing experience, Despatch laboratory ovens are the epitome of technological advancement and superior quality. Our ovens deliver invariable, uniform temperature for as long as the oven is in service thanks to its solid build quality and design. 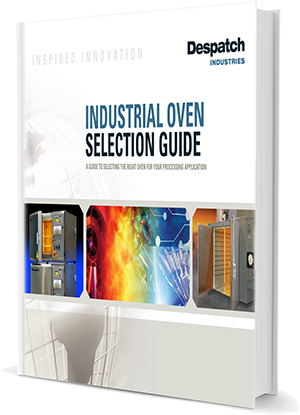 Despatch oven designs have been perfected version after version to deliver higher performance on a smaller footprint with low energy consumption. 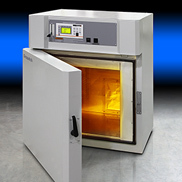 Standard benchtop laboratory ovens are versatile enough to handle a range of applications, and operate with unprecedented heating accuracy, temperature uniformity, and process repeatability. 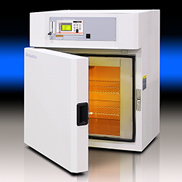 Despatch manufactures benchtop ovens, lab ovens, scientific ovens, small industrial ovens, benchtop furnaces, heating and drying ovens, vacuum ovens and furnaces. They are ideal for application processes such as drying, curing, annealing, aging, die-bonding, sterilizing, materials testing and other process critical procedures. 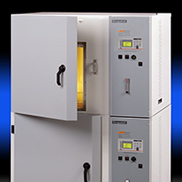 For applications that involve flammable solvents, we offer Class A benchtop and lab ovens that include a pressure relief panel, purge timer and exhaust fan to meet NFPA 86 requirements. 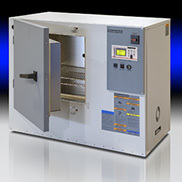 Despatch benchtop ovens are made in the USA with stainless steel or aluminized steel interiors, and a stainless steel or scratch resistant exterior finish. All oven models come with a five-year warranty on the heater and have one of the longest life expectancies in the industry. Most Despatch benchtop ovens feature the Protocol 3™, a microprocessor-based temperature and hi-limit controller with large LCD display and real time clock for auto start capability. The LCD display shows temperature readings along with clear, detailed information on oven status. The data-logging functionality enables reporting and analyzing and data files can be exported via the controller’s USB port. Modbus RS485 communications are included for easy data access. 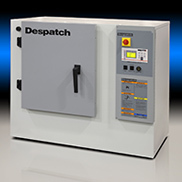 Despatch ovens are designed to be; simple to operate, long lasting, and to deliver the uniform and repeatable thermal processing. These ovens have been perfected over time by listening to our customer’s feedback and making key changes and improvements where needed. Despatch created a custom LCC benchtop oven and software system for a customer requiring the ability to scan product label bar codes and employee ID tags. The LCC system features special Protocol Manager™ software, individual “mini” PLCs with displays, and a touch screen operator interface. Despatch’s custom configuration allows employees to scan in the product lot labels prior to loading the product into the oven. Photo sensors in the oven chambers confirm product presence. The operator then selects the desired processing profile and follows the displayed prompts. The system logic sounds an alarm and locks out the oven controls if a cycle is interrupted or a door is opened before the cycle is complete. 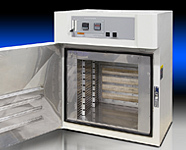 Despatch designed a custom LCC benchtop oven for a pharmaceutical company that needed an ISO Class 5 (Class 100) clean room oven that would meet NFPA requirements for drying medical products containing flammable solvents (acetone). The custom LCC was configured for Class A environments with the controls repositioned on the side of the oven. The front of the oven was attached to an isolation barrier to allow both the load and unload areas to be located in clean room environments. Despatch has modified its high performance LAC benchtop industrial oven to create a custom splicing oven for carbon fiber production. Carbon fiber manufacturers can use the oven to splice fiber strands together to keep fiber running continuously through the production line. Despatch made several modifications to the base LAC oven to create the custom splicing oven. Slots were added to the back of the oven with silicon curtains that seal around the product and reduce heat loss. Angled ledges around the door provide a stable place to set custom interior shelves. The oven has increased heater capacity to ramp up to temperature faster and efficiently maintain the set temperature. The addition of an electronic cooling fan filter protects the electrical panel from dust and debris. 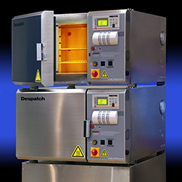 Despatch also equipped the modified LAC with an easy-to-use, digital single set-point temperature control and high limit.